Since my chest port was already accessed, delivery of the drug took just over a half an hour. Of course, we had previously waited about two hours to get admitted... There were no problems with any of the appointments, so we left the hospital when the Avastin delivery was finished. Posted 12/13. So much for the Etc (see post title). I had appointments set up for a very full day that Thursday, 12/03. Unfortunately, the MRI's ran long and I had a Doctor's appointment and chemo appointment postponed. Fortunately, I was able to make it back the very next day, and Moffitt was able to squeeze in the re-scheduled appointments. If you added-up the drive and wait times of that Thursday and Friday, the daylight hours were pretty much spent. I'm going to separate the posts from the two days, just to have a "break" in all of the "action." 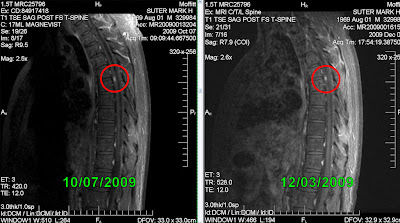 The MRI's showed my spinal tumor was a little bit smaller and it hadn't spread to elsewhere in my spine and my brain. (I didn't actually find these results out until around 11:30am the next day, since that is when the doctor reviewed them with me, but I'll put them with this post.) Anyhow, the overall MRI results were good! Thursday night (the first night), I had to go home with my "chest port accessed." This means that there was a needle in my chest port with some tubing hanging off of it. Under my skin, the port has a tube that goes into my subclavicle vein on my right side. It makes it easier to administer various intravenous tests or drugs. The fact that it was accessed overnight was not a big deal, I just had to make sure nothing inadvertently got caught-up and tugged on it... I meant to take a close-up picture of it, but I forgot.